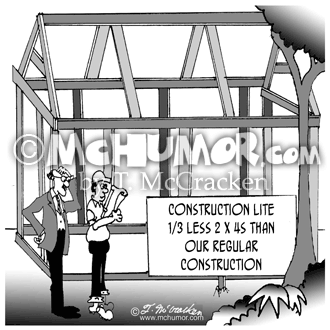 Carpentry Cartoon 6104: A building under construction with a sign, "Construction Lite, 1/3 less 2X4s than our regular construction." 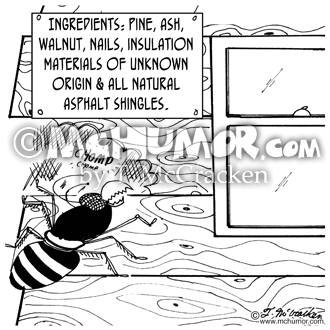 Someone asks: "And this was Okayed by the inspector?" 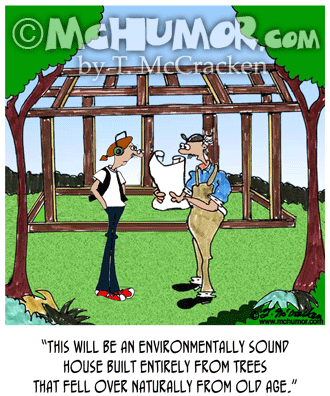 Carpenter Cartoon 6317: A carpenter carries piece of lumber with a baby on it and a diamond sign that says, "Baby on Board." 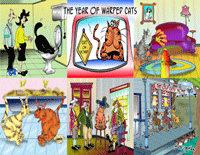 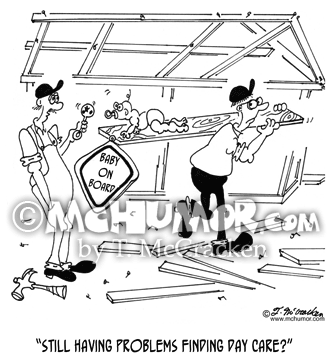 Another asks, "Still having problems finding day care?" 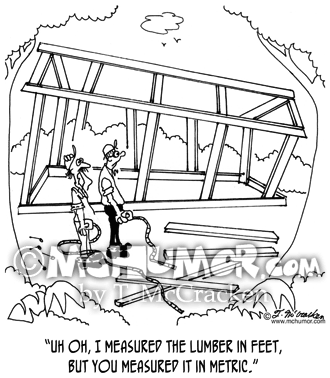 Carpentry Cartoon 6975: A dog working as a carpenter measuring a piece of lumber and saying, "I need a 10 foot board. 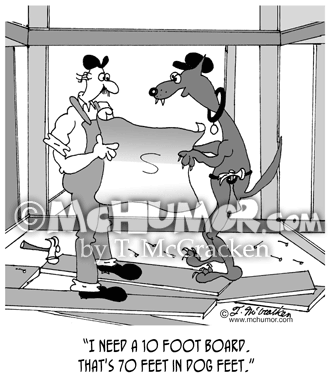 That's 70 feet in dog feet." 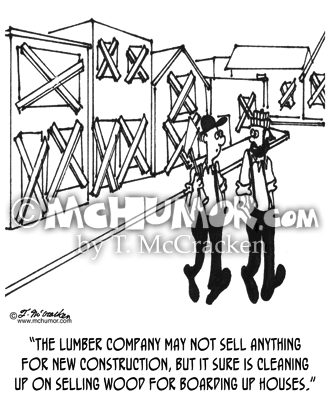 Lumber Cartoon 3689: Walking around a town where all the building's are boarded up a carpenter says, "The lumber company may not sell anything for new construction, but it sure is cleaning up on selling wood for boarding up houses." 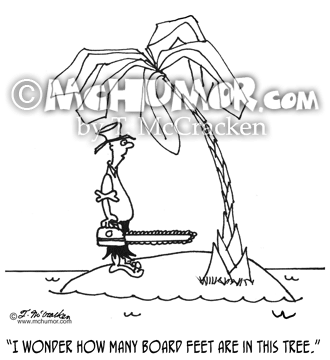 Lumber Cartoon 3699: On a desert island with one lone tree a man with a chainsaw muses, "I wonder how many board feet are in this tree." 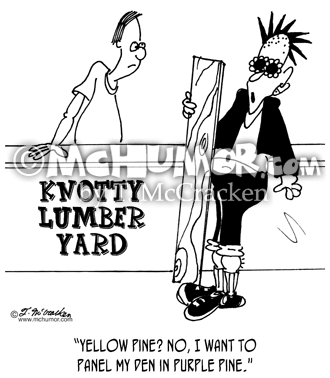 Lumber Cartoon 6136: A punk in a lumber store says, "Yellow pine? 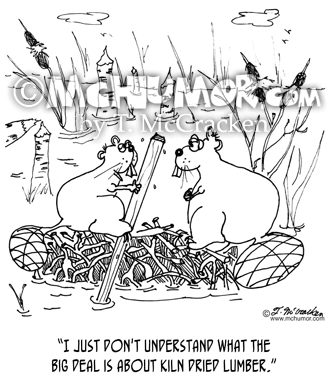 No, I want to panel my den in purple pine."